For SECU Family House guest, Mammie Summers, the last thing she wanted to hear in the fall of 2015 was that she had breast cancer. She had responsibilities, with two jobs, a family to care for, and now suddenly, her life was turned upside down. 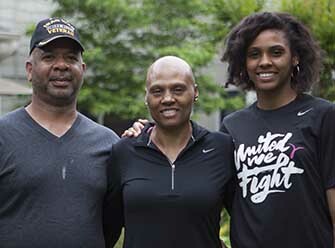 Diagnosed at Womack Army Medical Center with invasive lobular carcinoma, a type of breast cancer that begins in the milk-producing glands of the breast, this tall and reserved native of Fayetteville, North Carolina, was referred to UNC Hospitals for a second opinion. Under the care of Kristalyn Gallagher, surgical oncologist, Ellen Jones, radiation oncologist, and Lisa Carey, hematology oncologist and Physician-in-Chief of the North Carolina Cancer Hospital, Mammie’s treatment plan included surgery to remove the cancerous tissue and chemotherapy to shrink the tumors. During Mammie’s treatments at UNC Hospitals, she stayed at our hospitality house along with her husband, Garland, and daughter, Hillary. This past Mother’s Day, the family was able to watch Hillary graduate from Carolina with a degree in sociology. Hillary, at 6’2”, was a stand-out forward on the UNC women’s basketball team. Mammie tells us that as soon as she walked through our doors, “I felt I was going to be ok. Family House has everything I need as if I was at home.” The entire family also took advantage of the free passes we offer to our guests to UNC’s Wellness Center – a wonderful, comprehensive exercise facility just two miles away. Mammie also enjoyed the many new friends she made here. As Hillary tells, it, her mom “loves to be social” and making others feel happy. We would oftentimes find her, Garland and Hillary either cooking in the kitchen or sitting on the front porch in the rocking chairs, enjoying the fresh Carolina air and conversations with their new friends. Mammie said these activities always gave her the calm that she so needed while she was away from home. During the Summers family stay, it was evident to us that they lived by the proverbial phrase, "When life gives you lemons, make lemonade." They showed our guests, our staff and our volunteers that a positive attitude in the face of adversity always wins the day. Mammie and her family are featured in our Family House Diaries video series. Great story GOD BLESS YOU.